Awright, disclaimer time ('cuz I believe in that sort of thing): I've known Stephen Shumate for most of my life, though it's been the better part of twenty years since we've corresponded at all. But as is such these days we wound up hooking up again through Facebook. I've always thought Stephen as being one of the wisest and coolest people I've ever met (not to mention adventurous: he used to do crazy dangerous whitewater kayaking and probably still does). When it caught my eye that Stephen had written a book, well... that certainly piqued my attention. Especially when the title of it is Cars and Christianity. When I saw that title I was honestly expecting something very different. Like, maybe a book about the physical nuts 'n bolts of automobiles as much as contemplation upon spiritual life. Technical geek though I be, the inner workings of cars and trucks continue to mystify me (though that hasn't stopped me from getting three speeding tickets so far this year, but I digress...) and I was anticipating that Cars and Christianity would provide multi-disciplinary education across two disparate fields of interest. Alas! It did not. But Cars and Christianity is, however, a very thoughtful lil' tome of reflections upon the grace of God and the seeking after Him for guidance and wisdom. One that will be readily accessible and enjoyable to anyone. 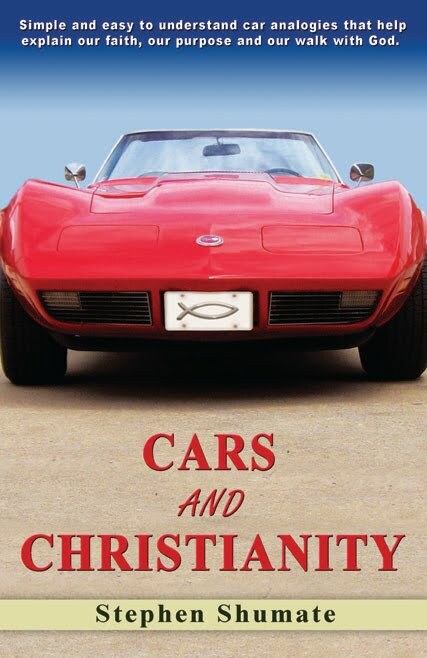 Cars and Christianity presents the walk with Christ as an auto restoration project (much like the one Shumate undertook with his '73 Corvette shown on the cover). The life of the believer is one that begins as a banged-up embarrassment of rusted chrome and Bondo-filled panels: one that MAACO wouldn't touch with a ten-foot pole. Yet the Master Mechanic that is Christ is more than sufficient to repair "every single dent and scratch", as Shumate puts it. So it is that in the beginning, the Christian's car is made better than sparkling new. And yet, as Shumate notes, far too many Christians are content to leave their cars sitting in the garage: accumulating dust and quietly rotting under the hood. And that's not what our spiritual vehicles are intended to be! Our cars are supposed to be driven hard and fast on God's highway, trusting Him to guide us even amidst smoke, snow and any other adverse condition. No life should be left idly in park. Indeed, that isn't much of life at all. But to hit the road as a believer in Christ is to have a more action-packed adventure than possibly anything depicted in Easy Rider or Thelma and Louise. All we have to do is be willing to put the key into the ignition. Wonderfully laden with insight and humor, Cars and Christianity invokes everything from NASCAR racing to the quirks of GPS. My only complaint about it is that I was left wanting more. But as a first-time book, it is a terrific work of analogies and applications for long-time Christians and new believers alike. I certainly came away from reading it feeling that it was time well spent... and time leading to deeper reflection upon my own faith. 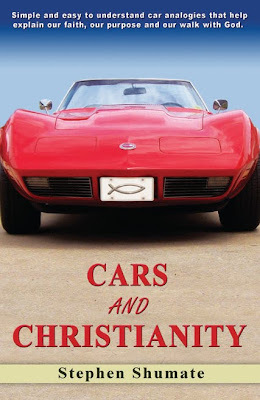 Cars and Christianity is available as softcover printed book and one of those new-fangled Kindle readers (and it can also be used on an iPad with the free Kindle app). BUT READERS OF THIS BLOG are getting the book for just $5.00! Simply head on over to this page that Stephen has set up for you nice folks and enter B7NY3ZL8 as the discount code. So you're getting a fun and edifying book, putting money into Stephen's pocket AND saving some coin for yourself all at the same time! Is that a great deal or what?! It is in fact a wonderful read.. Thanks Stephen.. I'm also searching out for the 3800 series 2 performance parts, inter cooler kit, drill and slotted rotors, drive chain etc. Please suggest me some online websites. Thanks. Very fantastic post, i am really appreciate you for sharing this useful information with us its really helpful for me.